Best Price Ninja Ads are caused by an adware application. 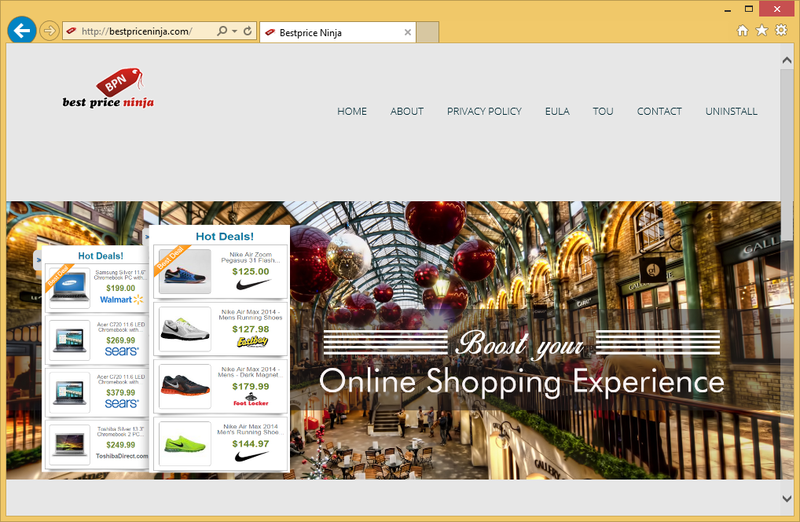 Best Price Ninja is a browser add-on that supposedly helps you shop by providing you comparison prices. While you might find this useful at first, after a while, it will become quite irritating. Especially since you probably did not install it knowingly. It got into your computer with the help of freeware and installed alongside it. This is a very popular method among unwanted item developers because no one would willingly install something that is useless to them. Once it’s on your computer, it will take over your browser and insert intrusive ads. They are supposedly there to help you shop, but the more likely purpose is to generate pay-per-click revenue for certain websites. You should uninstall Best Price Ninja Ads, and you best do it now. What does Best Price Ninja Ads do? It got into your computer along with free software. These kinds of items are optional but users end up installing them anyway because they are not aware they are there in the first place. Because they do not know about them, they cannot deselect them. When users choose Default settings, they are essentially giving the added items the permission to install. Advanced or Custom settings are the right options. In those setting, you will be able to deselect any added item, and it will be unable to install. Bear in mind that it can be quite difficult to delete Best Price Ninja Ads, so you should not allow it to install in the first place. Just like any adware, Best Price Ninja aims to generate pay-per-click revenue. It will try to make you visit sites by showing you tempting ads with deals that might not even exist. The adware can attach itself to all leading browsers, including Internet Explorer, Mozilla Firefox, Google Chrome and Safari, so you will not be able to escape the ads by changing browsers. You can only prevent them if you remove Best Price Ninja Ads. Besides generating annoying ads, it will also collect certain information so that it can make even more ads, and they would be made specially for you. It’s nothing sensitive, but Best Price Ninja Ads will have access to your IP address, search and web histories, etc. This information could also be shared with third-parties. Adware can also lead users to malicious websites where they could end up running into serious malware. And that would be an issue. We suggest you do not put your computer in potential danger, and uninstall Best Price Ninja Ads. Trying to delete Best Price Ninja Ads by hand can take up a lot of time because you will need to find it yourself. However, you can also remove Best Price Ninja Ads using a removal tool. Whichever way you pick, make sure Best Price Ninja Ads removal is carried out completely.